When I was a kid in the early 70s, I started collecting comic books in a hit and miss fashion. I’d buy issues with covers I liked. There were a few characters I was interested in, but I didn’t buy their titles on a regular basis until my best friend Todd introduced me to the idea of keeping up with storylines. He patiently explained that Marvel Comics (DC was probably doing the same thing then, but we were Marvel kids) had running stories that would go through several issues of a title. He was collecting The Uncanny X-Men and The Avengers at the time and his collection was so much more fascinating than mine. He had long runs of the titles he collected. I had a couple Hulks here, a Werewolf By Night there, but no collections of series. Todd’s comics were also in really nice shape. I don’t think they were bagged and backed, but they had been gently handled and carefully stored away. I wasn’t quite as careful with my collection. I had cut images out and even drawn on a few of mine. Todd’s example turned me into a serious collector and I’m grateful to him for that. The Avengers and The X-Men were among the first of the Marvel titles that became my passion. Especially, The Avengers. In fact, over the years I have collected nearly every issue of the first 200 of that series. I have less than five missing and, of course, those remaining are mighty spendy. The first Avengers I picked up was #171. It was part of a multi-issue battle with Ultron, but it was also the early stages of what came to be known as The Korvac Saga. Korvac was a villain from the 31st Century who betrayed the human race. Somehow he got sent back to the 20th Century and became a frequent foe of The Defenders. Eventually, he found his way onto Galactus’ space station and became imbued with the Power Cosmic, transforming him into the god-like man known only as Michael. Korvac before gaining the Power Cosmic. If you’re not familiar with the preceding stories and characters, then that paragraph will be a tad confusing. Just go with me here. And you should know there are spoilers ahead. In the saga, Michael has a plan for earth and humanity, but it will take time to implement. He and his girlfriend Carina, the daughter of The Collector and quite powerful herself, adopt a low profile and take up residence in a suburban neighborhood in Queens, New York. Something I really liked about Marvel Comics is that they would take their time setting up big stories. They would sometimes have a frame or two in a comic book months ahead of the big story just giving a little hint, setting up something to pay off much later. Marvel did that with The Korvac Saga. In issue #165, Iron Man gets a dressing down by The Scarlet Witch due to his frequent absences. He was the leader of The Avengers at the time but he was barely around, just showing up acting like nothing was wrong. She accused him of trying to act as though he’s saving the day. Iron Man was dumbfounded by this accusation, but there did seem to be gaps in his own timeline. Thor seemed to be doing the same thing. Curious. Later, in issue #174, we learned what was behind Iron Man’s and Thor’s frequent absences and reappearances. Other Avengers began to disappear before the very eyes of their teammates! Why? What or who was behind it? It was The Collector. An archenemy of The Avengers had been up to his old tricks of collecting earth’s mightiest heroes. Except this time, he claimed to be doing so to save humanity from The Enemy! That’s how The Collector referred to Michael – The Enemy. The Collector was collecting The Avengers to protect them. However, our heroes were able to foil his plan and remain uncollected. The Collector implored The Avengers to rid the universe of this awesome threat and, when The Enemy used his powers to rid the universe of The Collector right in front of them, they took notice. The hunt for The Enemy began. They trace this awesome threat to that Pleasant Valley Sunday neighborhood and commandeer a city bus to get them there. That led to a funny moment when all those superheroes pile off the bus as the neighbors were out cutting their grass. Why take a bus? Long story. Don’t worry about it. Issue #177 was the epic battle. The Avengers along with the Guardians of the Galaxy gave their all to defeat this most terrible threat to humanity, but one by one Michael defeated them. And this was a battle to the death. Although there was a moment or two when Captain America and Wonder Man seemed to be getting to him, Michael also easily dispatched of them. It took The Collector’s daughter Carina, in an act of betrayal, to finally defeat The Enemy. To kill Michael. Thor then killed Carina. Not intentionally! Carina had used her powers to kill herself with lightning from the Norse god’s hammer. One superhero present had not joined in on the battle. Moondragon believed there was deception at work. She believed The Avengers had been duped. For she had looked into Michael/The Enemy’s heart and learned his intentions were benevolent. He wished to create a utopia for humanity, not destroy it. He had become angry when The Avengers attacked and allowed his anger to put an end to the heroes and his plans, but as he lay dying next to his beloved Carina, he reached out with his last bit of strength and restored to life all whom he had killed that day. Thor reverted to his alter-ego Dr. Donald Blake and attended to his alive but in need of medical attention comrades. As he did so, the memories of The Korvac Saga began to fade from his and the rest of the heroes’ minds. Moondragon would be the only one who would remember the terrible mistake The Avengers had made. The Korvac Saga is still one of my favorite storylines ever produced by Marvel Comics. Star Wars is so hot right now, so let’s look at The Avengers. The Avengers was my favorite title of Marvel Comics when I was a kid. I’ve managed to collect nearly all of the first 200 issues. I’m missing only the very most expensive ones, so I’ll have to wait until this blog makes me rich or I win the lottery. So, I’ll probably never own them. Anyway, I dug back into the archives of my personal blog and found this one discussing the virtues of Avengers #164. I’ve given this write up a little updating and revision, but it’s still about how cool I thought this comic book was. Issue #164 features guest penciler John Byrne. John Byrne is one of my all time favorite comic book artists. This issue was one of his early efforts for Marvel Comics, but he would soon make a huge splash in the comic world when he became the regular penciler for the X-Men (starting with issue #108). I love Byrne’s work. For quite some time I considered him the top artist at Marvel. George Perez was a close second, but Byrne’s work just had something that impressed the hell out of me. He continued to produce great work for many years until he began writing titles as well as drawing them. Then he seemed to hurry his drawing. The Avengers #164 was early in his career at Marvel, but he was already showing those signs of greatness. His inker was Pablo Marcos for this three issue series, giving George Perez, Avengers’ regular artist, a break. However, I am focusing on the first part of the three issue story, because as I’ve always found the set up issue seems to be more interesting than the conclusion issue of a story line. The synopsis of this issue tells of an old Avengers’ villain, Count Nefaria, recruiting three other villains: Power Man, Whirlwind, and the Living Laser (known as The Lethal Legion), to help him defeat the Avengers once and for all. Through the efforts of the team of scientists he employed, Count Nefaria enhances the powers of the three recruited bad guys. But only temporarily. This reunited and boosted Lethal Legion rob a bank, the Avengers try to stop them, but the Legion get away and to regroup and counterattack. At the end of their counterattack, the bad guys appear to have the upper hand and are about to become victorious when their powers begin to mysteriously disappear. Enter Count Nefaria, crackling with the super powers he’d just stolen from the Lethal Legion. That dastardly double crosser! 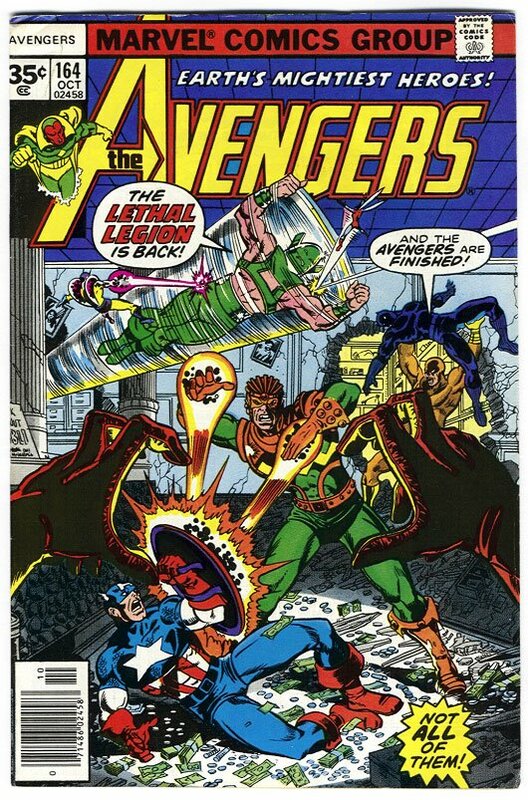 The cover (see above) was draw by George Perez and it depicts the Lethal Legion putting the beat down on the Avengers. Power Man states that the Avengers are finished, but someone is shouting, “Not all of them!” But who is it? We do see a pair of gloved hands, but the story doesn’t let us know who it is. Is it Yellow Jacket? The Wasp? The Scarlet Witch? I guess we aren’t supposed to know. It was a common practice in comic books to have cover art that didn’t exactly fit the story inside. The first frame I’m including is the beginning of the second battle between the Avengers and the Lethal Legion. The three bad guys decide to use the old attention getter of throwing a car through the window of the second story conference room of the Avengers’ mansion. How the Legion knew our heroes were gathered there I don’t know. 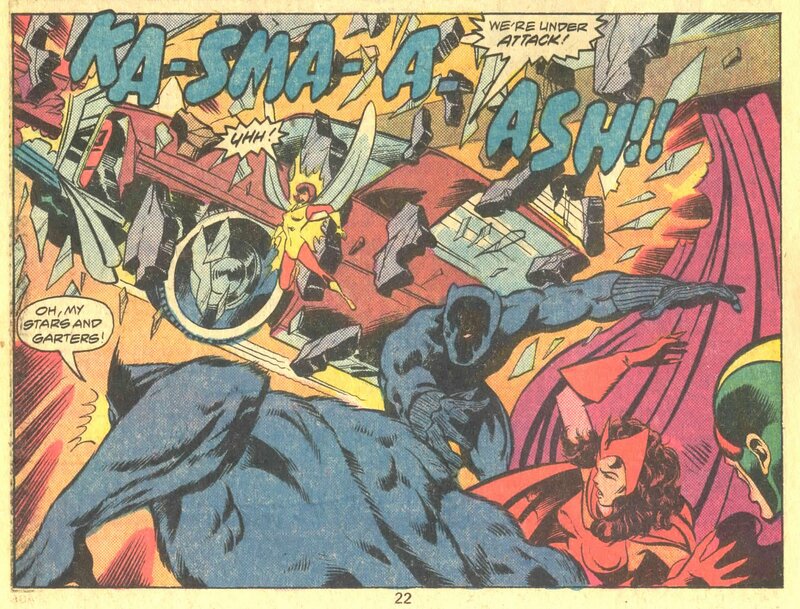 Still it is a dramatic shot with the great sound effect “KA-SMA-A-ASH!” Marvel always did pride themselves with their uncannily descriptive sound effect words. Next is a two frame sequence in which we get to see just how much more powerful Power Man has become. At the expense of the Beast, unfortunately. Poor Beast, that looks like it hurt. Then I have the last page of the issue. 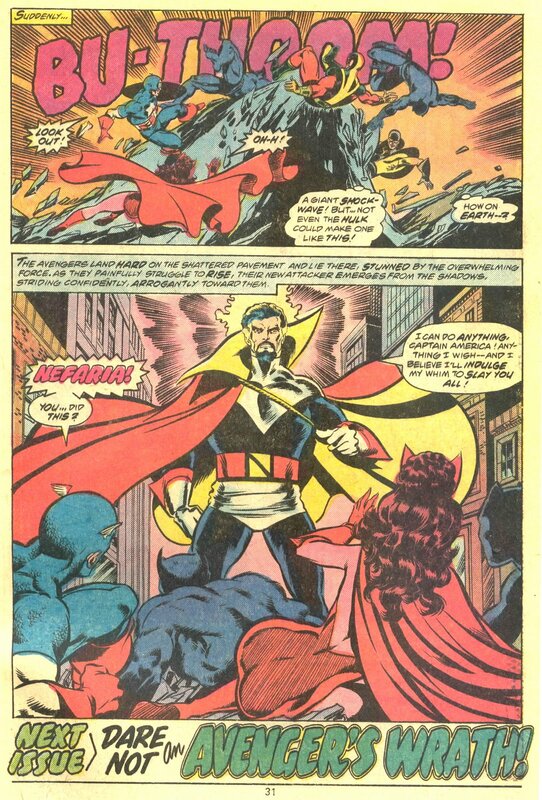 Here is where Count Nefaria makes his dramatic entrance. He tears up the street under the Avengers’ feet, sending them all down to the ground, stunned. A shocked Capt. America recognizes the villain and can’t believe Nefaria is capable of such a display of power. And doesn’t the Scarlet Witch have quite the nice behind? He grabs a trellis rod and spins himself backward into the wall to keep from colliding with his daughter. I always thought the drawings were confusing. Why would he go backward? Looking at it now, I think I understand what happened. The Whizzer (Yes! That is his name!) must have reached to his right to grab an “off camera” trellis rod and that’s why he’s flung backward into the wall. I guess Byrne had difficulty fitting the trellis into the first frame. This is my favorite era for comic books. The art was improved, in general, over that of the early 60s. I like the use of newsprint and full gutters on the pages, with the occasional breaking of the frame in the big action sequences. But then again, I’m probably just nostalgic for the simpler days of my youth. Yes! He was called The Whizzer!